We supply rare stones to fine jewelers and collectors around the world, especially Burma ruby, Ceylon sapphire and the finest spinel, topaz and garnet. Gem collectors have always sought out the finest specimens, with an eye for stones that are likely to increase significantly in value over time. 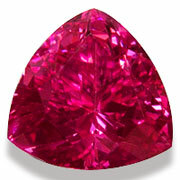 But recently we have seen a growing interest in rare and unusual, even obscure, gem varieties. Strictly speaking, all gem-quality minerals are rare. That is because only a tiny fraction of the minerals found in the earth are sufficiently transparent and clean to be called gemstones. 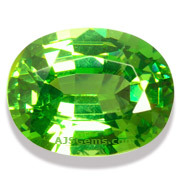 But within the world of gem-quality stones, some gems are relatively common and and inexpensive. These are the stones you will find set in low-cost commercial jewelry, such as blue topaz, pyrope and almandine garnet, onyx and lower grade amethyst, citrine and peridot. On the other hand, there are certain gems which count as especially rare and are sought after by collectors and museums. These rare gems fall into two main categories. Some gems belong to rare varieties, where only a small number of specimens are known to exist. Any high quality specimen would count as rare. Then there are rare individual gems, distinguished by their exceptional color, clarity and size. Almost every gem variety has some especially rare specimens. Some gems varieties are entirely rare -- you will find few very quality specimens of cuprite or jeremjevite or pezzottaite. In other cases there are rare colors in well-known varieties, such as pink tanzanite, yellow tourmaline and green zircon. High quality ruby and sapphire are rare in almost any size, especially so for unheated stones. 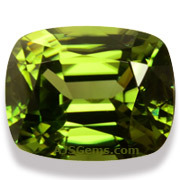 Some rare varieties, such as tsavorite garnet, are found in only a single location. Some locations are famous for producing the finest material in a particular variety, such as demantoid garnet from Russia, spinel from Mahenge, Tanzania and gem silica from the Inspiration mine in Arizona. Every collector has his or her own interests. With the holiday season approaching, we invite you to browse our extensive collection of rare gems for a special stone for the gem collector in your life. This month we feature special collectible gems, including a matched pair of Russian demantoids, a one-of-a-kind raw spinel crystal and a superb unheated yellow sapphire from Ceylon. Demantoid Garnet from Russia is one of the rarest gems in the world, especially in sizes over 1 carat. So this matched pair of 2 carat Russian Demantoids from the famed Babrovka River area of the Urals counts as especially rare. A perfect match in terms of color, shape, brilliance and fire, both stones display the striking horsetail inclusions that are characteristic of top-quality Russian Demantoid. A unique natural spinel crystal for your collection. 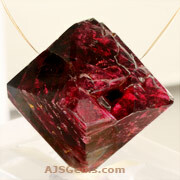 Weighing in at an impressive 80 carats, this huge (23 x 20 x 30 mm) uncut red crystal forms a perfect octahedron. A natural hole through 2 faces make this gem ready for a pendant chain. A very special piece for crystal connoisseurs! Few natural gems approach perfection in color, clarity and cut. 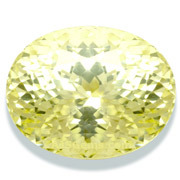 Here is one: an exquisite yellow Ceylon Sapphire in a large size. Outstanding clarity and fine cutting make this lemon yellow sapphire a real sparkler. Absolutely clean with remarkable fire. Simply an outstanding gemstone for the sapphire collector. Certified as natural and untreated by Asian Institute of Gemological Sciences (AIGS), with origin noted as "Sri Lanka." The rarest and most expensive variety in the quartz family is a type of chalecedony known in the trade as gem silica. Colored a vivid greenish-blue by copper, the finest examples exhibit considerable translucency as well as a vivid color. This rare round 5.47 ct beauty is from the Inspiration Mine in Arizona, the source for the finest gem silica. The neon pink-red spinel from Mahenge, Tanzania is ultra-rare, with all the material coming from a single find in 2007. Gem dealers are unanimous in calling these the finest spinels ever discovered. This extraordinarily vivid 2.23 ct trillion has been certified by GemResearch Swisslab (GRS), with the color stated as "vibrant pinkish-red". 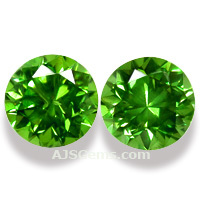 Green zircons are exceptionally rare. They form as the result of natural radiation in a process known as metamictization. Over long periods of geological time, radiation produces changes in the crystal lattice so that these metamict zironcs are amorphous rather than crystalline, while still maintaining the characteristic zircon fire. This fine 2.19 ct green zircon from Tanzania is an outstanding example, with excellent clarity and a bright apple-green color. Free Shipping for the Holiday Season! For the months of November and December we are offering free FedEx shipping on orders over $500, and free registered mail shipping on orders over $100. This offer expires December 31st, so take advantage of this opportunity to save on your purchase of fine stones from AJS Gems. Sotheby's called it "the greatest white diamond ever to appear at auction," and it set a new record of $30.6 million at the Oct 7th Magnificient Jewels and Jadeite auction in Hong Hong. However, the Premier Blue, a rare 7.59 ct. fancy vivid blue diamond that was expected to set a record per carat price for any diamond, failed to find a buyer, with bids falling below the $19 million reserve. Do harder gems have a higher refractive index and thus more brilliance? Though harder gems (7 and above on the Mohs scale) tend to take a good polish, there is really no connection between hardness and refractive index. Many hard gems -- such as diamond, sapphire and spinel -- do indeed have a high refractive index. But some softer gems also rank high for refractive index, including cuprite (hardness 3.5-4), sphalerite (3.5-4) and sphene (5-5.5). Some gems which are quite hard, such as topaz (8), and members of the beryl family (7.5-8), do not have a particularly high refractive index. There is a connection between density and refractive index, however -- gems with a high refractive index are invariably quite dense. The reason that none of the major gemological labs (GIA, GRS, Gubelin, etc.) give clarity grades for colored gemstones is because there is no standard clarity scheme for colored gems like there is for diamonds. In the gem trade, clarity standards in fact vary for different gem varieties. 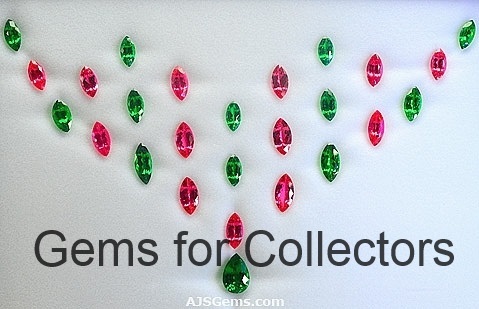 Some gem types, like emerald and rubellite tourmaline, are almost always found with significant inclusions, and even a high grade specimen is likely to have eye-visible inclusions. Other gems, like ruby, sapphire, spinel and the various garnets, usually have some inclusions, and an "eye clean" grading would be typical for a high grade specimen. Then there are other gem types which are typically very clean, such as aquamarine, tanzanite and imperial topaz, where a fine specimen would be "almost loupe clean." 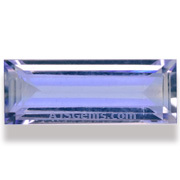 For more information see our article on Clarity Grading for Colored Gems.